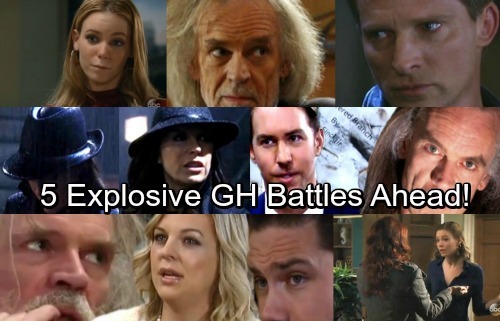 General Hospital (GH) spoilers tease that some heated confrontations are coming up. Several characters will find themselves stuck in conflict over the next few weeks. Some of them will even seek it out! Let’s look at all the hot drama ahead. Here are five fierce faceoffs that fans can look forward to. GH viewers can expect Felicia (Kristina Wagner) to rip into Finn (Michael Easton) over the Anna (Finola Hughes) situation. She’ll probably slam him for walking away from a good thing. General Hospital spoilers say they’ll clash over what the future holds. Finn clearly wants to be with Anna, but he’ll fight his feelings for now. For that reason, Finn’s sure to get an earful from Felicia! It’s been a while since Bobbie and Nelle sparred, but another battle’s brewing. General Hospital spoilers say Bobbie will put Nelle on notice. She’ll want to make sure Nelle knows where things stand. If Nelle thinks she’s going to get Michael (Chad Duell) back, Bobbie will suggest she’d better think again. She’ll warn that this baby won’t change anything, but Nelle will undoubtedly hint that it just might. Anna is keeping some big secrets, so she’ll be desperate to stop Sonny (Maurice Benard) from digging. As Sonny closes in on the traitor, Anna will plead with him to back off. When that doesn’t work, Anna should go for a harsher tactic. A shouting match is on the way. GH buzz hints that Anna may be Peter’s (Wes Ramsey) mother, so we’ll see if that pans out. Nathan’s (Ryan Paevey) gearing up for his inevitable showdown with Faison (Anders Hove). Unfortunately, he’ll be in a dire situation. General Hospital spoilers suggest that Nathan’s departure is drawing near, so Faison could easily capture or kill him. Nathan will face his father and spark major trouble in the process. Jason (Steve Burton) deserves his chance to confront Faison, too. Will he get his shot after Nathan’s takedown efforts fail? Regardless, Jason’s vengeful desires will grow. GH fans would love to see Jason give Faison what he has coming! It sounds like General Hospital has some exciting scenes in store. We’ll give you updates as other news comes in. Stick with the ABC soap and don’t forget to check CDL often for the latest General Hospital spoilers, updates and news.